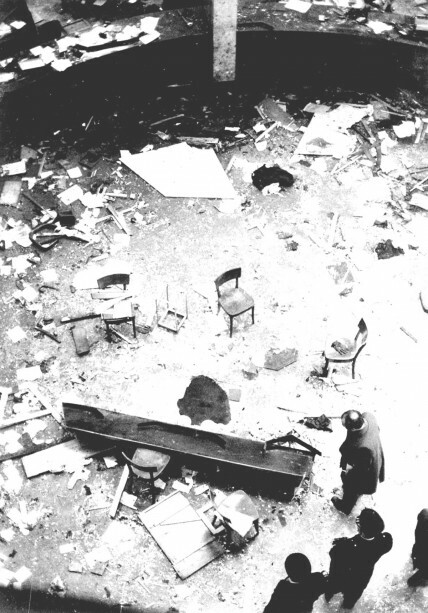 The Piazza Fontana massacre of 12 December 1969 is a crucial milestone in post-war Italian history. It was on that date that the criminal intentions of a political class — which demonstrated it would shrink from nothing to cling on to power in the face of ‘the onward march of communism’ — was made flesh. This class did not baulk at leaving a trail of corpses in its wake in order to prevent its leadership being called into question. The Piazza Fontana massacre is not some ‘obscure episode’ in Italy’s history — ‘the nightfall of the republic’. It is a clearly defined chapter whose narrative is that dead bodies are preferable to political change and over the years that followed many more would perish — mainly at the hands of the right, but also some at the hands of the left. It was a perverted game. The right had attacked, therefore the left had a duty to retaliate, thereby cranking up the ‘index of conflict’. It was an absurd situation that threw every proposal for radical change to Italian society into crisis. Viewed in this light, the Piazza Fontana massacre has both left its mark on — and made — history, an unfinished one at that. The spotlight switches from the ‘criminal lunatic’ anarchists to the Nazi and fascist culprits. Thrown together in the dock they will be cleared, each and every one of them. So who was responsible? There are no culprits, apparently. Then, after any chance of convicting the chief culprits is rules, the finger is again pointed at the Nazi-fascists. Eventually, 500,000 secret service files turn up in a dump on the outskirst of Rome — and even these appear to cloak other mysteries. It is a real Italian comedy, if not tragedy. The tragedy centres on the outrages of December 1969; the defining moment of a strategy that was intended by its authors to act as the midwife to an authoritarian regime. It was a strategy operated by the highest bodies of state for the purpose of neutralizing political opponents and conjuring up a climate of fear aimed at keeping the Christian democrats and their alies center stage. It is in this respect that the Piazza Fontana massacres provides the key to the code of Italian society; it exposes the role of ministers, the Italian and foreign secret services, magistrates and police. There is no other way to describe it, they are all implicated in a criminal undertaking. Reconstructing the event, therefore — the roots of which can be traced to the bombings on 25 April and 9 August 1969, amounts to zeroing in on the hidden essence of the Italian state. We are not dealing here with rogue agencies that have strayed from their remit. That is the one big lie that the media has sought to peddle when there was no way of covering up the responsibilities of the ‘state’s servants’ any longer. The reality is much simpler and much more disconcerting: ‘The presence of sectors of the state apparatus in the development of right-wing terrorism cannot be thought of as ‘deviant’. It amounts, rather, to the conventional exercise of institutional functions’, wrote Guido Salvini, Milan’s examining magistrate who spent the years between 1989 and 1007 investigating right-wing subcession and the Piazza Fontana massacre. We see, then, how the term ‘state massacre’ acquires a validity that transcends political slogans inasmuch as it focuses on an irrefutable truth..
One final point. This book may be committed, but it is not partisan. I, the author, was a witness to these events along with — up until the day he died on 15 December 1969 — Giuseppe Pinelli. I was also an active participant in the campaign to secure the release of Pietro Valpreda, so I have an emotional involvement too. But thanks in part to the near-on four decades that have passed since that fateful December day, I have striven to achieve some distance and display as much objectivity as I can muster.